Wicked Hybrid Water & Silicone Blended Lubricant - 4oz. Super silky waterbased lube that's east to clean as well as toy and latex friendly, blended in harmony with a rich bodied silicone that lasts and lasts. 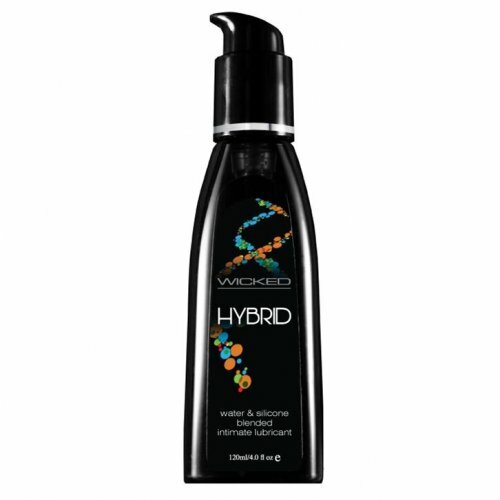 This fusion hybrid lube is an excellent choice for all types of play. Apply to area where lubricant and sensation is desired. When done, rinse away with water. If irritation or discomfort occurs, discontinue use and consult a physician. This product is not intended to use as a contraceptive. Avoid contact with eyes and keep out of reach of children. Water, Olea Europaea Olive Leaf Extract, Laminaria Hyperborea Seaweed Extract, Propylene Glycol, Sodium Polyacrylate Dimethicone, Cyclopentasiloxane, Trideceth-6, PEG/PG 18/18 Dimethicone, Cellulose Gum, Phenoxyethanol, Ethlhexylglycerin.